Tap at various spots on your photo to choose a background colour. Adjust the background colour with a set of sliders. 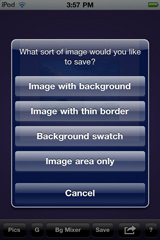 Select from various saving options: wide background mat, thin border, background swatch, image only. Reopening and resaving allows you to combine mats and borders to create your own composite frames. Play with changing backgrounds behind transparent images. Use large swatches or provided gradient images to focus on colour effects. Random colours are used in some gradients. See the pixel size of any displayed image. (Large images may be reduced for display). Saving adds a new jpg image to the Camera Roll album. Use portrait or landscape orientation. Help is available within the app. 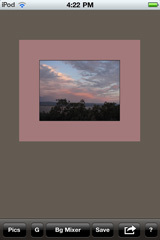 NEW FEATURE - PALETTES - You can now enjoy creating square 9-section palette images from photos. Swipe down at any time to record the current background that you have chosen. Your palette images can be saved to the Camera Roll (Saved Photos) album. Quickly test different colours which might enhance your photos. Experiment with different combinations of mats and borders as a preliminary to getting your photos professionally framed. Choose an image that you have saved with a background mat and test it against a background that matches the wall colour of the room where it would be placed. Save a background swatch of a colour that you like. Then, in your device settings app, simply choose that swatch as home screen wallpaper. Experiment with swatches to find backgrounds that show up the swatch colour. 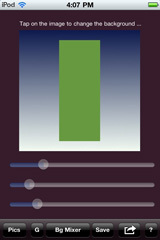 Use provided gradients to see how the background colour can change the spatial effect of an image. If you are viewing a linear gradient saved with a thin border of a contrasting colour you will notice that image distortion occurs as you change the background colour. Play with the partially transparent random gradient to see the many different colour effects of simply changing the background of a transparent image. Notice that the centre of the radial gradient is opaque and can be used to change the background colour. Play with the PB icon, which is partially transparent. Clicking on a solid colour will change the background and make that part disappear. The edges of the solid colours are antialiased with thin gradients so borders show around the colours as the background is changed. Paste designs which have been copied to the clipboard with a transparent background, eg. by the app ShapeScene Little. Watch the effects as you make controlled changes to the background. - Save and load swatches. Then set different backgrounds behind the swatches to observe simultaneous contrast and other effects. - Try to match a grayed background to the value of a bright swatch so that the swatch appears on the same spatial plane as the background. - Observe the vibrating effect of placing bright contrasting colours behind a bright swatch. - Test warm and cool swatches against various backgrounds. - Use a radial gradient to observe after effects. Save the gradient with a background mat. Next reload it, set the background to the mat colour, stare at the image for a few seconds and then transfer your gaze to the background. 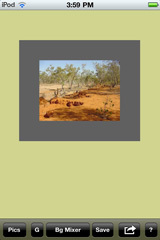 The effect of this is increased if the original gradient had a dark centre and was saved as an image area with a white background. 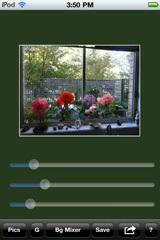 An iPad version of this app called Plain Background Fun is available. Click here for other iPhone/iTouch/iPad applications. Have you found that the above suggestions have helped your understanding of colour on devices? Perhaps it is time to try designing with another DARE Software app - ChipScene Little. This page has a series of simple design challenges which were created for the ipad version of ChipScene Little. Many of them however can be done with ChipScene Little.